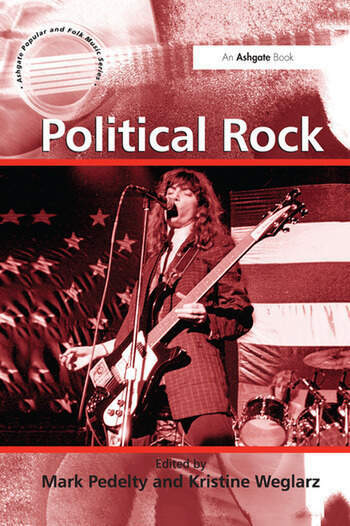 Political Rock features luminary figures in rock music that have stood out not only for their performances, but also for their politics. The book opens with a comparative, cultural history of artists who have played important roles in social movements. Individual chapters are devoted to The Clash and Fugazi, Billy Bragg, Bob Dylan, Rage Against the Machine, Pearl Jam, Sinead O'Connor, Peter Gabriel, Ani DiFranco, Bruce Cockburn, Steve Earle and Kim Gordon. These artists have been chosen for their status as rock musicians and connections to political moments, movements, and art. The artists and authors show that rock retains a critical strain, continuing a tradition of rock politics that matters to fans, activists, and movements alike. Contents: An introduction to political rock: history, genre, and politics, Mark Pedelty and Kristine Weglarz; The Clash and Fugazi: punk paths toward revolution, Mark Andersen; Peter Gabriel: the masked activist, Mark Pedelty; Bob Dylan: someone else’s stage, Keith Nainby; Bruce Cockburn: Canadian, Christian, conservationist, Aaron S. Allen; Billy Bragg: mixing pop and politics, Douglas M. McLeod; Sinéad O’Connor: a collision of bodies, Marcy R. Chvasta; Steve Earle: the politics of empathy, Mark Mattern; Kim Gordon: ordinary, feminist, musician, Norma Coates; Ani DiFranco: making feminist waves, Nancy S. Love; Pearl Jam: the conscience of arena rock, Kristine Weglarz; Rage Against the Machine: militant poetics, Michael LeVan; Index. Kristine Weglarz is an Assistant Professor of Telecommunications and Film at the University of West Florida’s Department of Communication Arts. Her dissertation and research focuses on the political economy of live rock performance, constructions of authenticity, protest rock, mediaphemes, and 'liveness' as cultural constructions. She teaches courses on multi-camera electronic video production, popular music and media studies, introduction to mass media, and the political economy of media. Mark Pedelty is an associate professor of Mass Communication at the University of Minnesota. He is the author of War Stories: The Culture of Foreign Correspondents (1995), Musical Ritual in Mexico City: From the Aztec to NAFTA (2004), and Ecomusicology: Rock, Folk, and the Environment (2012). Pedelty has also published a number of journal articles dealing with popular music, including 'Woody Guthrie and the Columbia River: Propaganda, Art, and Irony' in Popular Music and Society 31(3): 329-355 (2008). Dr Pedelty is currently conducting applied research concerning music as environmental communication.